Wow, what a detox! 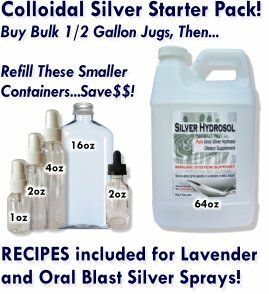 Colloidal silver rocks! I recently bought your buy 3, get one free offer for the half gallons with the intention of using it to detox. I had a friend do the same with excellent results! I followed her recommendations to drink ionic colloidal silver a few ounces at a time throughout the day, swishing it in my mouth before swallowing...I see you recommend swishing it too or maybe she got that from your site. I did this 5 or 6 times a day for a couple days and voila! At first I was feeling a brain fog, then some soreness like I was coming down with something. I've had flu shots in the past (not anymore, and never again!!!) and it was kind of like that, where it felt like I was coming down with a flu or something but I knew I wasn't. I continued this for a couple more days while also drinking tons of clean filtered water with a pinch of sea salt in order to help my body flush out the dead toxins. After about a week to a week and a half, I seemed to have flushed all the crud out and now I feel amazing! Thanks for making this affordable and I look forward to sharing my experiences with others!